President-elect Vladimir Putin has told reporters that he was not surprised by the recent protests and that the opposition must shift from street actions to serious political work. One of the first questions the reporters asked was about Putin’s attitude to recent protests against the elections violations as well as to the police actions towards the protesters. The president-elect answered that in his view the police acted very professionally during the March 5 rallies. 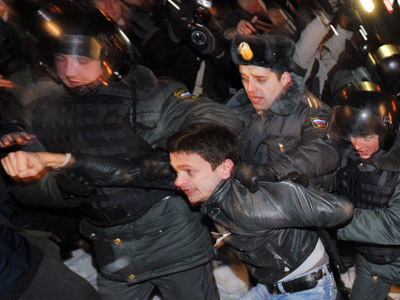 “They did not beat up anyone, they did not use any special means and they pushed the protesters away only after the protesters started to break the limits,” Putin said. He also noted that the police saved several journalists who were attacked by protesters by hiding them in police vehicles. “A number of demonstrators were pursuing the goal that the police apply physical force to them,” the president-elect noted. 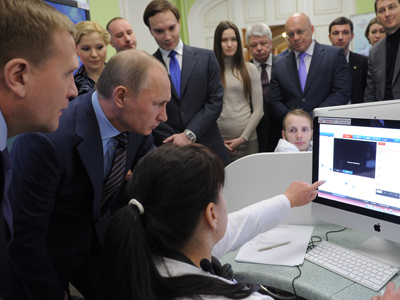 Putin added that he was not surprised by the memorandum of the Voters’ League that declared the elections illegitimate over numerous reported violations. “There is nothing new here. They stated this even before the elections,” he noted. “They say that the authorities must listen to the people’s voice. The opposition must listen to this voice as well,” Putin said, adding that the Right Cause party, which earlier was represented in the parliament, had lost completely at the last elections. “This means that the people did not like what they offered to the society and they must make their conclusions,” Putin said. “It is not enough to express oneself in the streets, one must present to the voters a real program of positive development,” he stated. Putin also said he considered Dmitry Medvedev’s order to check the legality of the sentence imposed on former oil tycoon Mikhail Khodorkovsky and his associates the right decision. Putin also added that he still saw no political background in Khodorkovsky’s case. 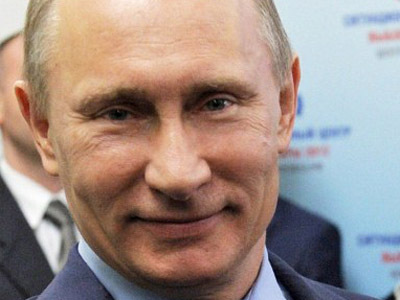 “My friends, we keep talking about some political component in this case, but you have eyes and ears and you have read the European Court verdict – it is written there that the European Court for Human Rights sees no political background there,” Putin told reporters. The president-elect promised to start the consultations over another problem raised during the election campaign – the unfairness of the Russian privatization and the economic reforms of the 1990s. He said that the question was complicated as the decision had to be acceptable for the community and business people alike, but stressed that the solution must close this discussion once and for all. 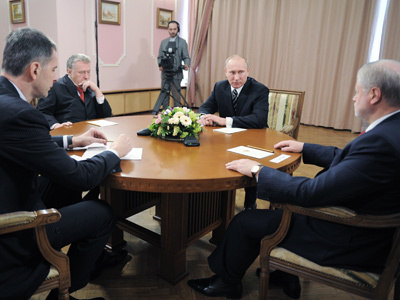 Putin also touched upon certain foreign policy issues and his answers were generally within the established course. He reiterated that the reason behind the Russia-Georgia spat was in the actions of the Georgian authorities and that he hoped that Russian and Georgian peoples found the solution to the crisis. He added that Russia cannot withdraw its troops from the republics of Abkhazia and South Ossetia as this would allow Georgia to repeat its aggression. The Russian leader-elect reminded that he always tried to persuade the Georgian President Mikhail Saakashvili to refrain from violence and avoid bloodshed, that Russia fulfilled its obligations and withdrew from the Adjaria region, but Georgia did not reply with the creation of a joint anti-terrorist center, as was promised. “How can you hold talks with such people?” Putin asked reporters.